followed the text. There was pride in them. order and justice to not only this city, but the world. kept on her desk. It was taken at the team's beach party that past summer. This wasn't just her team, this was her family. Hello out there in the champions heroverse! We have some news for the month of march! 31st. So put on your best writting cap and show us what you got! of participants, we will decide if there are runner ups or only one grand prize winner. contest. We are looking forward to seeing your work! Silver Age Sentinel Spooky Halloween Party! Hi everyone, it's Aquamarina again to deliver another special announcement. 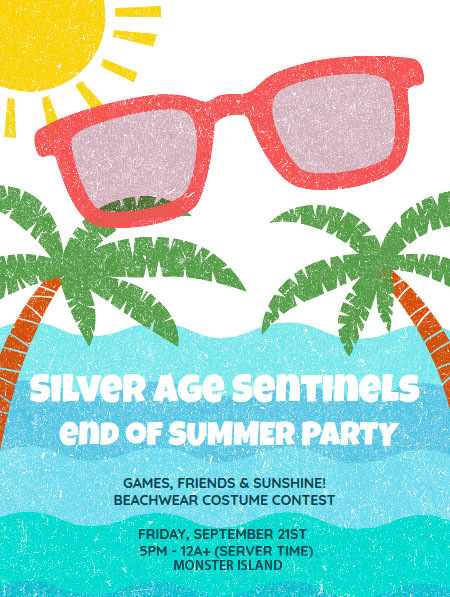 Since our last gathering at the beach was such a success, for the month of October it's my privilege to cordially invite everyone to attend our Silver Age Sentinels Spooky Halloween Party! This coming Saturday, October the 20th at 8pm (Server Time) until the party's end. I'll be there a little earlier at 5pm if anyone would like to attend early. We have more activities planned for the evening, including another costume contest. The theme for the costumes will be a fictional super hero! The party will be held in the crypts area of Vibora Bay. If anyone has any questions please feel free to send me a message on our communicators or ask me in person. I can’t wait to see you there! End of Summer Beach Barbecue! Hello everyone, I’m Aquamarina and I have a special announcement to make. Summer is almost at an end the officers of the Silver Age Sentinels want to reward everyone for their hard work and resolve patrolling the city during these past few months. 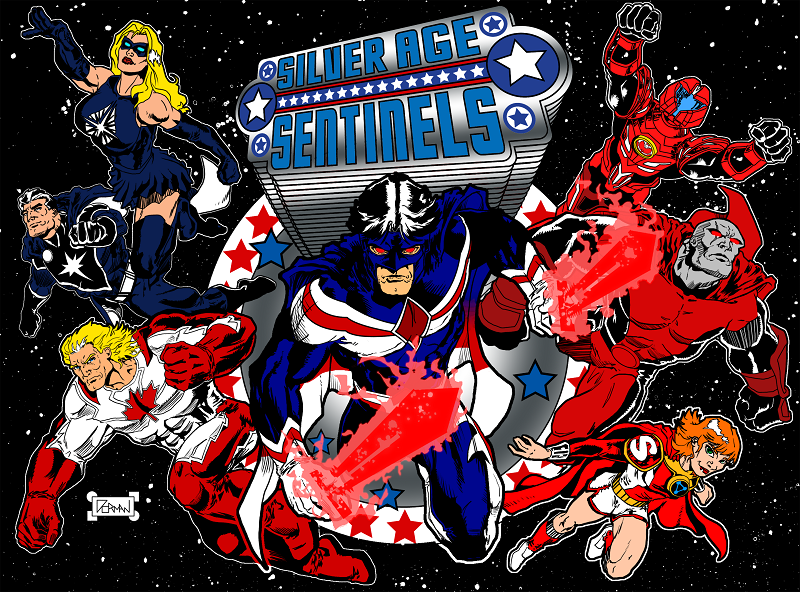 So it is my honor to cordially invite you all to attend our Silver Age Sentinels end of summer beach barbecue! This coming Friday September the 21st at 5pm (Server Time) until closing. We’ve also got several activities planned, including a costume contest! That’s right, come in your best beach attire and the top three will win a prize. The party will be held at the recreational beach located on Monster Island. The Dread Pirate Queen Faye has captured Valarie Duncan but what does she have in store for her? It is up to GLOBE and the Sentinels to track her down and find out. And of course Valarie would appreciate the rescue! The event is slotted for the 8th (that's tonight using server time). Finiash Time: Estimated to run from 2-3 hours. Bring your game and stop Faye from doing something Dread-ful to Valarie! on the Champions online message boards. It's time we all consider openning up to new members once again and welcoming other RPers that are interested in our original classic comic book values and themes. Along with this I'm going to find a way to include all the information given in the first two posts of that thread and put it all up here on our very own website, possibly on the forum, along with slightly more codified rules and regs to minimise confusion about what we are about, what we are into, and what is more or less verbotten. I admit it's been a long time coming, but this is only the beginning. I'd like to be setup and ready to host the "Open Mic Night" around 4pm my time (AZ) which should be around 6pm east coast. After the event, I'll post up a "set list" of everyone who performed with the video links i was sent. -Please, bear with me, I'm not 100% sure how smoothly this will go. Hopefully everything works perfectly and everyone has a blast. See you all tonight, At the Midnight! I've been hearing some chatter about this local event, and it seems some of you missed the flyer so I'm posting it up for anyone interested. (I know we have more than one singer in the community!). Looks like the event is going to be this comming saturday, the 10th of december, at 6. Just a reminder, It's getting cold out there and even though many of us can handle the cold, no problem, to protect our Secret ID's, put on those winter weather clothes and grab a mug of hot cider with the local citizens we support and protect. I hope you can make it, it sounds like it's going to be a blast! I'd love it if folks tracked down some songs or youtube video links that we can post in local over the course of the evening, that represent their characters' open mic singing. As the flyer states, try to find accoustic songs or covers of songs to maintain the feel. Also, since this is a holidy-ish themed event, it would be awesome if folks tried to make winter-weather outfits, to maintain the theme. 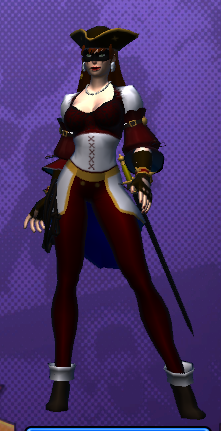 I know that it's a little dependant on costume slot space and costume pieces, but it would really add to the feel of the event. 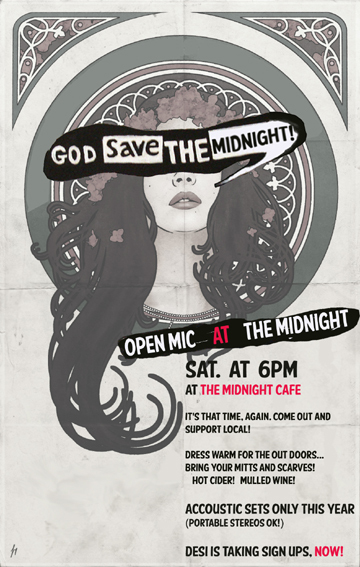 As for the location of the event--- "The Midnight Cafe" is a new location I'm trying to introduce to the GLOBE community. It is a modestly sized, out of the way corner of Millennium City Center, that conveniently has no pedestrian or enemy mob traffic. It is a pair of courtyards (a fountain and a sand garden) between two buildings with some decent outdoor seating. The courtyards, that I'm calling "the Midnight Cafe," are located north, up the main street from Darren's and directly west of City Hall. I promise, once you've been there once, it's easy to find. and safe to get to, even for a level 6 character. The details of the Midnight and its proprietor, Desi Somerset, will be posted up on the forums sometime this week. Check the events page, halloween party incomming. 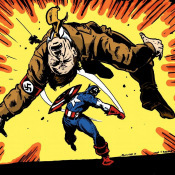 Art by Guild member and comics artist Micheal Dorman. Thank you, Mike. 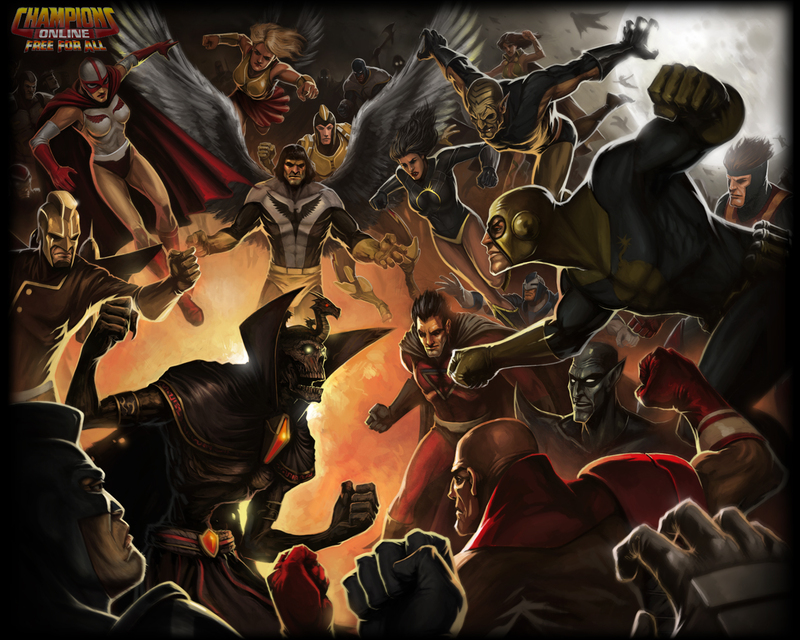 In August of 2009, after playing for over a year in the Champions Online Alpha and Beta tests, I flirted with the thought of forming my own guild, taking with me everything I'd learned from many years of membership and fledgling leadership in groups in City of Heroes. I had balked at the amount of work I knew building a real community was going to take, but eventually I decided that this was the game that was going to be my virtual home, and this was where I should invest the time and effort to create something around myself that would keep me logging in day after day. Selfish? ...Maybe a little, but I knew the right group of people would synergistically feel the same way I did. I had pre-ordered the game of course, at Amazon I think, and due to a snafu with mail deliveries, my physical disk didn't arrive in the mail until the sixth of september, almost a week after the launch on September the first. Now, I already had the client downloaded and fully patched, I'd been in game for the three day head start that began right after the two week long Open Beta had ended, so a quick email to Cryptic customer service [remember that?] solved the issue pretty fast, so I was only unable to log in for like one whole day, the fifth of September. 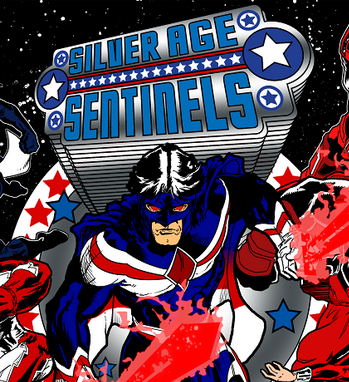 On the Sixth of September, 2009, I officially formed the Silver Age Sentinels on the live server. I honestly can't remember who those other four players or character were with me when I formed the group, or who my earliest reecruits were, but on a post on the Mutants and Masterminds Think Tank boards, I saw a post from Scott Bennie, bemoaning his inability to locate quality RP in Champions, so I responded to him there and met up with him in game, and made sure he learned about us, and about CORP.
Later in his online guise as Thundrax, Scott was instrumental in finding some quality early RPers who became mainstays with us for years, such as Small Girl and Valentyna. I ran into Riley Nero in the desert while playing my new and quite 'lost' alt, Abyss, and they struck up a friendship. I tended to send people friendly little "Awesome costume and Bio!" PMs anywhere I saw them on any alt, and the early Sentinels formed out of this core of people making great looking and well written characters. I made it a point to personally interview each and every member of the guild, for over four years. I refined this recruitment process to both shorten it's leangth, and get to the heart of the things that mattered most to me, and to our style of "Lite RP", building a real world group of friends first and online RP dramatic set up second. And the rest is History. or something. Miss Incarnate Happy anniversary to all. Rune thanks for posting that bit of history. A Time To Get Social! Tomorrow (saturday, 5/28, in the states) two of our Young Sentinels have invited anyone interested to an out door barbecue cook out at Sakura Park in downtown Millennium City. According to the twins, the party will be 'Open house style", and once the party begins, they expect to host, until the last guest leaves. They hope to be set up by 2pm (server time, pst) near one of the public pools, so feel free to bring suits, if you want to take a dip! For those of us raised here in the states, this weekend is in memorial to those heroes and armed forces men and women who have fallen in service to the nation and the defense of the ideals of liberty and justice. While we hope you have a great time, take a moment to reflect on the fallen. I know we have a few legacies, a story shared from the past would be more than welcome, if you'received willing. In any case, and perhaps in defiance of the dangers that currently threaten the city, we hope you'll stop by ready to relax and enjoy some food, some tunes, and some friends. ~the Lady Titan, Jo' McKay.